During the years that Leiden University maintained a chained library (1595-1653) the books were placed on the shelves upside-down. Read here why. 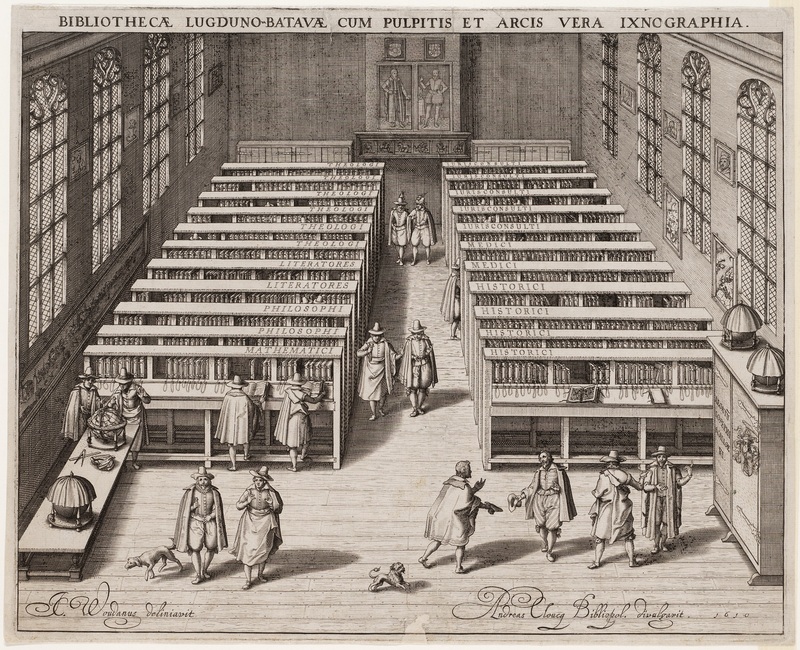 The well-know depiction of Leiden University Library from 1610 – engraved by Willem van Swanenberg after a drawing by Jan Cornelisz. van ’t Woudt and published by the Leiden bookseller Andreas Cloucq – shows the arrangement of the books after their removal to the first floor of the Beguinage Chapel in 1595. The folio books were housed in 22 plutei, book cases that combine storage and reading facilities. The volumes were chained to a horizontal iron rod that ran parallel to the lectern shelf, thus forcing the visitors to consult the books while standing in front of each case. The books in smaller formats were placed in closed cases in the back of the library room. This arrangement was maintained until 1653, when the rapid growth of the library collection made it necessary to abandon the chaining system and replace the plutei by large open book cases for books in all formats, not to be accessed directly by the visitors. According to its title the engraving claims to be a ‘vera ixnographia’, a faithful representation of the library’s interior around 1610. However, the way in which the folios are depicted on the shelves (fore-edge and clasps outwards) is incorrect; in reality they were placed spine outwards. This inaccuracy becomes clear when we take a closer look at the books originating from this period. They are described in the Nomenclator autorum omnium quorum libri vel manuscripti, vel typis expressi exstant in Bibliotheca Academiae Lugduno-Batavae. This catalogue was published in 1595 on the opening of the new library. As an example we choose the Rerum Britannicarum Scriptores (Heidelberg: Commelinus 1587), which according to the Nomenclator (cf. page G3 verso) was placed as nr. 45 in pluteus a of the ‘Historici in Folio’. A copy of this edition with medieval Latin texts about England and Ireland is now kept under shelfmark 404 A 16. Leiden University’s device has been stamped in black on the upper and lower cover of the parchment binding: Minerva reading above two crossed keys (the city arms) and the abbreviations “ACAD.” and “LUGD.” (for Academia Lugdunensis). These abbreviations, helping to protect the book against theft, are also found on the head and tail edges. The outside and inside of the lower cover clearly shows traces of a chain attachment: little holes for the rivets that fixed the copper plate bearing the chain; see also the discoloration of the flyleaf and pastedown caused by the oxidation of the now missing plate. The spine contains, written in ink, an old shelfmark “a. xlv” (middle) and a title (partly faded): “RERUM / BRI / tannicarum / Scriptores” (bottom), information which is not present on the front edge. These observations allow us to conclude, firstly, that this is indeed one of Leiden’s formerly chained books and, secondly, that the binding was placed spine outwards on the shelf. A final peculiarity is still in need of explanation: both the shelfmark and title are written on the spine upside down when compared to the device on both covers and the printed text block. The labels of the current shelfmark 404 A 16, on the contrary, have the right orientation. This must imply that the folio books wered placed in the plutei upside down. But for what reason? By a happy coincidence (or is it thanks to a librarian with a sense of historical perception and foresight?) one of the chained bindings has been preserved together with its chain. It is a Greek manuscript with the sermons of St John Chrysostom on Saint Paul’s Letters to the Romans and Ephesians (BPG 37), still absent from the library catalogue of 1612 but mentioned in the 1623 catalogue (cf. p. 7). In this case, too, the title has been written upside down on the parchment binding. The length of the chain is remarkably short: merely nine links connect the attachment at the lower cover to the ring that once fastened the chain to the iron rod. When bindings with such a short chain are placed upside down on the shelf (spine forwards, chain attachment at the bottom), a visitor can consult them only by tilting them towards himself and letting their spine rest on the lectern shelf, with the chain attachment now on top. Every other way of arranging and handling chained books will need a much longer (and more expensive) chain and, furthermore, will heighten the risk of mechanical damage to the selected binding or its neighbours. Traces of use in books regularly provide essential information to reconstruct their provenance or the history of a library collection. That is why it is important to preserve old bindings as much as possible. Leiden’s copy of the Rerum Britannicarum Scriptores received conservation treatment at UBL in 2014, thanks to the financial support of the Verhaagen family, via the ‘Adopt a book’ programme created by the Friends of Leiden University Libraries foundation.